It’s getting to be that time of year again when apples are in abundance. Once fall hits I’m all about eating caramel apples. Dip them in caramel or chocolate and cover them with nuts, m&m’s, sprinkles, coconut, you name it and I pretty much love it! Eating caramel or candy apples can be quite the task so I find I eat them by slicing them with a knife. I’m curious, do you eat them by biting into them with your teeth or slice them? Ever since I was a child I’ve been eating Merb’s Bionic Caramel Apples – the best candy apples on the planet, IMO. from a local company here in St. Louis, Missouri. Nothing has ever come close to comparing to their apples. About 4 years ago I decided to create my own candy apples knowing quite well I’d never be able to duplicate Merb’s, I ventured out to try my own version. Since I’m also a huge fan of Chocolate Caramels I decided I’d make Chocolate Caramel Apples and they were amazing! Rich, thick, gooey, chocolaty, and with the buttery taste of caramel. What could be better? I surprised myself that these turned out so well. For added richness I used Lyle’s Golden Syrup, the secret ingredient. 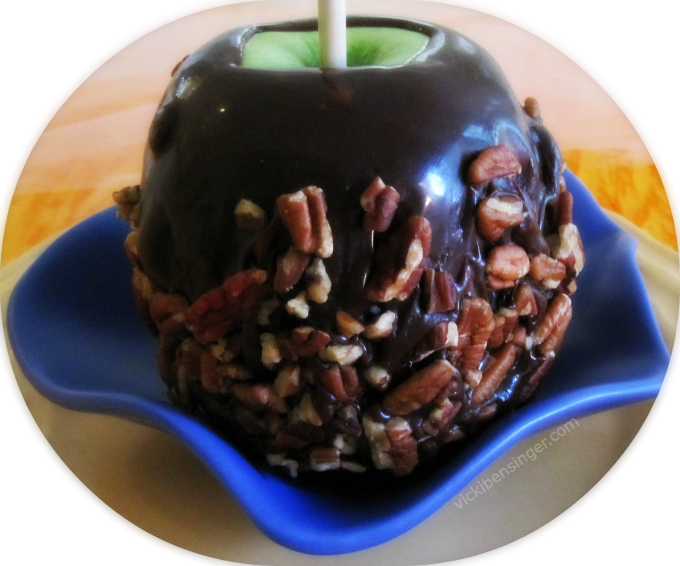 If you’re a fan of caramel apples and chocolate, please give my recipe a try. I know you’ll love it! Don’t forget, with Halloween just a little more than one month away make a batch to give to your friends, and their children – I guarantee you’ll get rave reviews! 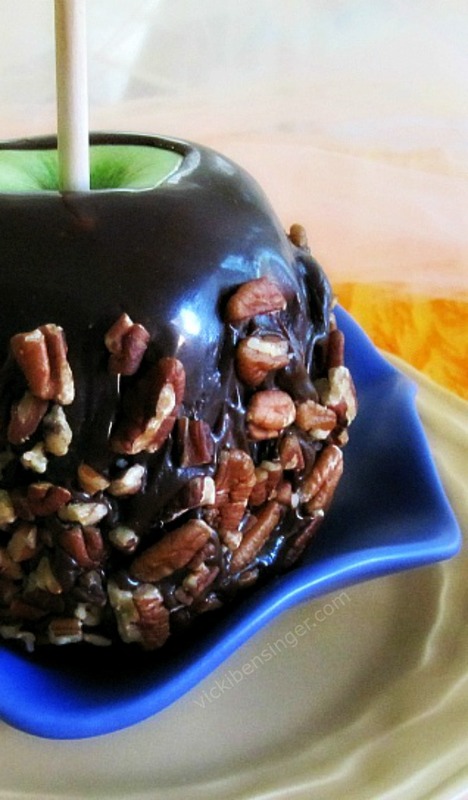 A rich, chocolate, buttery, caramel apple to savor! Remove from heat. Bring sugar, corn syrup, water, and salt to a boil in a 5- to 6-quart heavy pot over moderate heat, stirring until sugar is dissolved. Tilt pan and carefully (can splatter and burn you) pour in chocolate mixture (mixture will bubble and steam vigorously). Continue to boil over moderate heat, stirring frequently, until mixture registers 255°F on candy thermometer – about 20 minutes. (Times will vary depending on the climate in your room.) Note: Do not rush this step. It may feel like it takes a long time for the caramel to reach this temperature, but if you rush it by turning up the heat, you will burn the caramel, and waste all your ingredients. Be patient, and you’ll be thrilled with the results. If desired dip coated apples in chopped pecans, toffee chips, or drizzle with melted white chocolate. Can be refrigerated for several days. To give as a gift place in plastic gift bag, and tie a ribbon around the stick to keep bag closed until gift-giving! I could seriously get into this apple, it looks amazing Vicki! 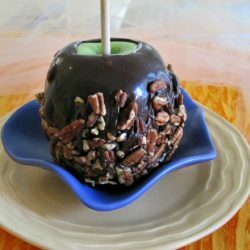 A nice alternative to traditional caramel apples! Thanks Chris I agree but then I love chocolate caramels. I’ve had plenty of caramel apples, but chocolate? Don’t think so. Never even thought of it. Seriously good stuff — thanks. 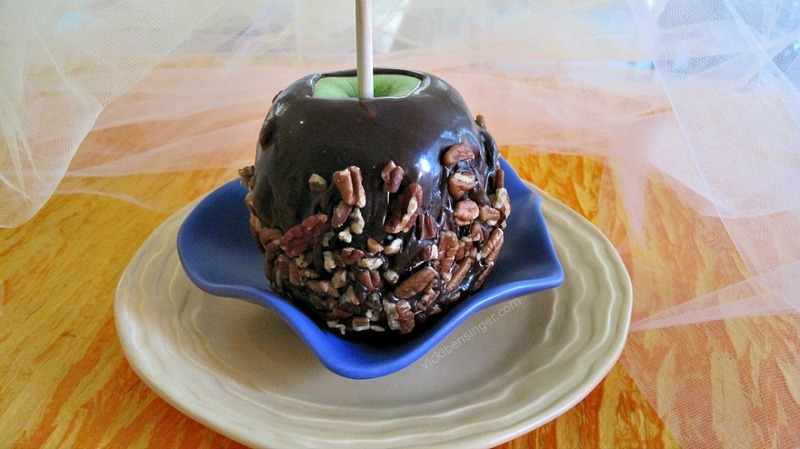 Chocolate Caramel Apples – oh yeah they’re real good! This looks awesome! The combo of caramel and chocolate sounds divine. It is divine Angie! I hope you try them. Thes are gorgeous caramel apples, Vicki! You could sell these gems! Like John, I’ve never eaten a chocolate caramel apple, but now I have a huge craving!! Oh thank you Liz, I’d love to sell them. They are wonderful. If you enjoy chocolate caramels then you’ll love these.